It's few and far between when you get a sandwich that isn't bland and boring... something we try to shy away from. While we have a wide variety of sandwiches to choose from, we said, "Why not one more?" So for the time being, we are offering a house made crab cake sandwich. While most crab cakes are served as an appetizer, we felt that this was actually too big to serve as a beginning course. We mix generous amounts of real lump crab meat with corn, black beans, and roasted red pepper to form a flavorful sandwich that could rival any New England crab cake. Served on top of our house baked 9 grain whole wheat bread with a fresh spring green mix, alfalfa sprouts, tomatoes, and a dijon mustard sauce, this sandwich screams "summer is just around the corner." 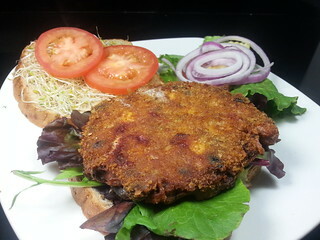 And if a sandwich is not your thing, try our crab cake on any one of your favorite salads for a southwestern kick. In either sense, we're guaranteeing that this sandwich is not your run of the mill meal, but rather one that will have you coming back for more!